Come delight in the bounty of winter squash! In this class we’ll learn how to cut, cook, and prepare a variety of pumpkin and squash dishes. You’ll never have to fear the dreaded butternut or question how to tackle these autumn beasts again. Instead, come celebrate the abundance of fall as we pickle pumpkins, roast whole squash, make pumpkin pie filling from scratch, and feast upon winter squash chili. This class is 2.5 hours and includes refreshments and hearty snacks. Cost is $50 per person. To register, click here. In the contact form, please let me know which day you plan to attend so that I can send you the proper invoice. A Dutch Baby is a fantastic weekend treat in our house. It’s quite simple to make but requires a bit of patience while it cooks. For those of you who are new to Dutch Babies, these popovers have their roots in German cuisine and are much like a heartier baked pancake. Their high egg content makes them quite filling and high in protein. Traditionally made with sugar, these can also be prepared as a savory breakfast. Leave out the sugar and other sweet ingredients and serve it with bacon, cheddar, and tomato jam (just a suggestion 😉). 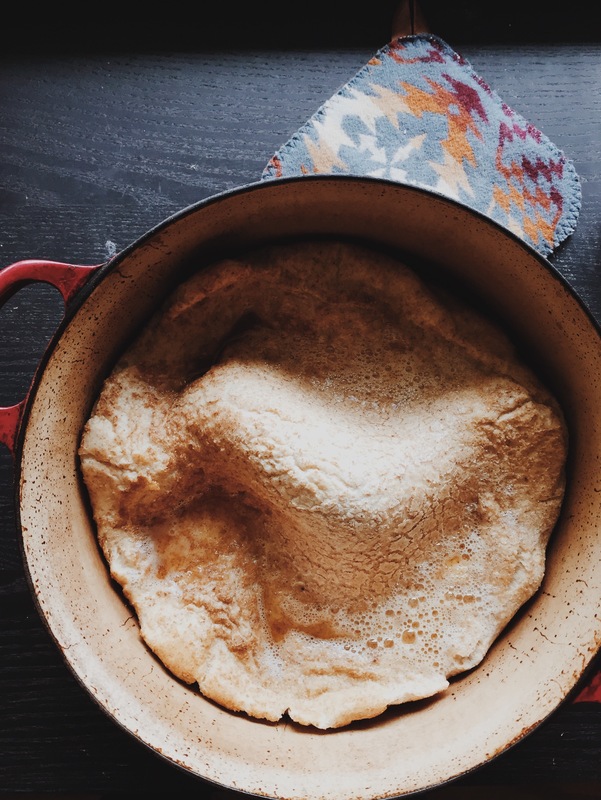 One Dutch Baby serves two for a lighter breakfast or one for a stick-to-your-ribs breakfast. It can easily be doubled. 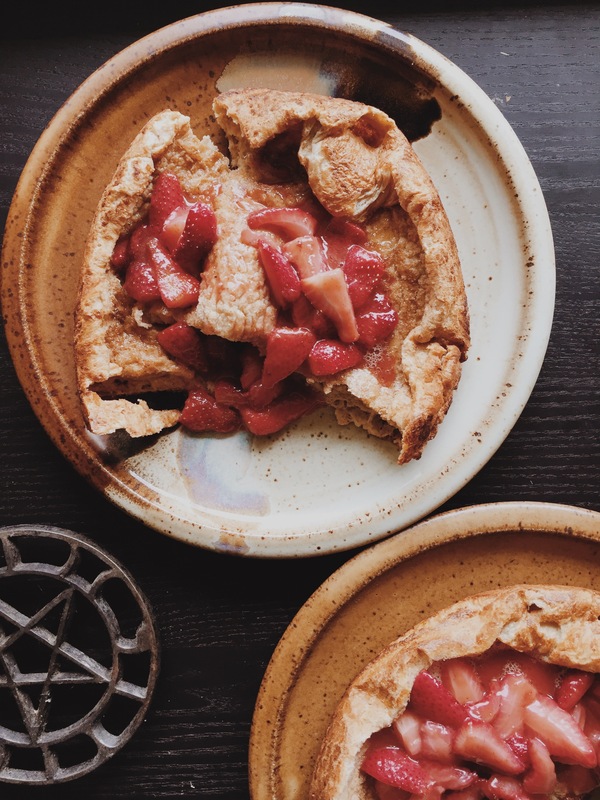 This recipe is inspired by my friends at Jubilee Farm who are growing and milling their own whole wheat as part of their CSA. Fresh whole wheat flour has a distinct nuttiness and richness that simply cannot be beat. If you can get your hands on some I highly recommend it for its higher nutritional value and superior flavor. Place a cast iron skillet or Dutch oven on the center rack of your oven. Preheat the oven to 450°, allowing the pan to heat at the same time. Meanwhile, combine all ingredients except butter in a medium bowl and whisk until smooth. When the oven has reached its temperature, add the butter to the pan. As soon as it has melted, carefully tilt the pan to coat it with the butter and quickly pour in the batter. Bake for 12-14 minutes until the Dutch Baby has puffed up and is golden on top. Serve with your favorite toppings like fresh fruit, maple syrup, and/or a dollop of yogurt. Serves two. In our house, we eat granola almost everyday. With homemade yogurt and fresh fruit for breakfast, by the handful as a snack, or with milk for a very lazy dinner… it never disappoints! After years of tweaking my granola game, I’ve finally settled on this recipe. The only sweetener it uses is maple syrup, so it is much healthier than the grocery store options with ingredients I can’t pronounce. Use this recipe as a guide. You can easily change out the fruit and nuts. Sometimes I make this with cherries and walnuts or hazelnuts and figs. The cacao nibs in this recipe are the raw parts of the chocolate pod and contain lots of phytonutrients. They have a slightly bitter flavor, much like dark chocolate. You can usually find them in the bulk bins at your local health food store or, if you live in Seattle, they can be purchased from Theo Chocolates. Can’t find them? No worries, just leave them out. In a large mixing bowl, combine sunflower/coconut oil, maple syrup, vanilla, spices and salt. Stir until well mixed. Add oats, cashews, sesame seeds, and coconut flakes and stir until evenly coated. Spread into an even layer on a large baking sheet lined with parchment paper. Bake for 30 minutes, rotating the granola halfway through. When done, allow to cool for 1 hour. Add blueberries and cacao nibs, gently stirring to incorporate. Store in an airtight container for up to a month, though I doubt it will last that long.